The 19-year-old singer joined the music mogul, L.A. Reid and fellow new judge Britney Spears on the 'X Factor' panel for the first time at auditions in Austin, Texas, and Demi's mum Dianna Hart de la Garza was particularly enamoured with 52-year-old Simon. Responding to a tweet made by the show's official twitter account claiming Demi thought Simon was cute, she revealed: "No Simon-that was my mom! "@TheXFactorUSA: Simon told us that Demi thinks he's even better looking in person. @ddlovato is this true? 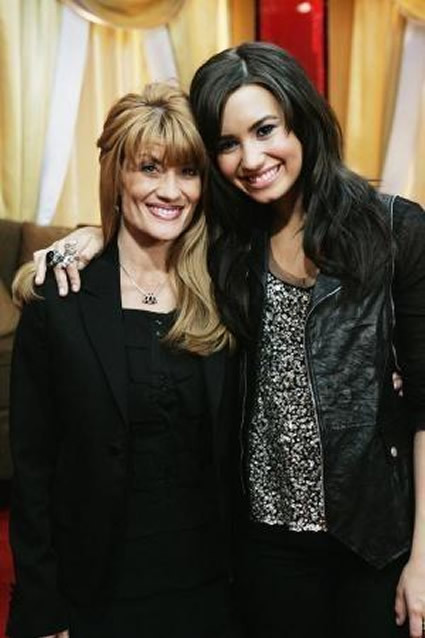 (sic)"
Demi had a great first day in her new job and at one point she jokingly called Simon "grandpa" when he tried to play matchmaker between her and one of the pop hopefuls on the Fox show. The 'Skyscraper' hitmaker tweeted: "OMG!!! This is so much fun! #XfactorUSA ... Such an amazing day ... can't wait to do it again!!! #XfactorUSA (sic)"
Reports from the day's filming claimed Britney, 30, walked off set because she was so dismayed by one auditionee's dreadful rendition of her song 'Hold It Against Me'. But the 'Womanizer' singer laughed off the claims, insisting she just went for a break. She wrote on her twitter account: "Britneywalksoff??? LOL was just taking a little break people. I am having the BEST time!!! (sic)"
Demi and Britney were brought in to pick the acts following the departures of last season's judges Nicole Scherzinger and Paula Abdul.